This is all the luxury of body butter and then some. This is literally the balm. This body balm has all the moisturizing capability of the body butter base, but improved ability to soak in quickly. It is designed to be used alongside your Young Living Essential Oils to give your skin the ultimate spa treatment at home! Just make your base, add your oils and moisturize to your heart's content. 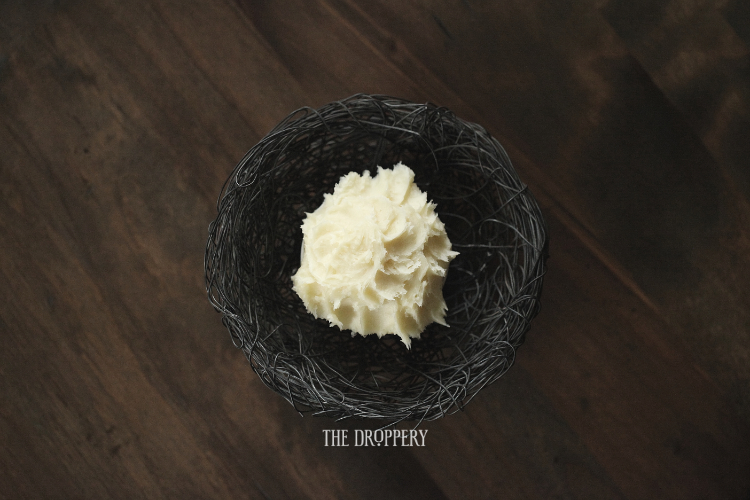 Simply melt the beeswax, cocoa butter and shea butter into a liqud. Add in the jojoba and marula oil then pour into a glass jar to let cool in the fridge for 30 minutes or so. OPTIONAL: WHIP IT UP! Want it fluffy? Place the body balm in a mixing bowl and let chill in the fridge for about 20 minutes then whip on high for a few minutes until peaks form. Pop it back in the fridge for another 30 minutes and you're done! It will stay whipped up unless exposed to high temperatures, in which case, you simply chill and whip again. I like to keep my bases as they are and add oils in as I go to apply it to my skin. If you know you're going to be using the same combo often, you might separate some into it's own jar and add your oils in ahead of time to make it easier. It's totally up to you! AGING SKIN | Royal Hawaiian Sandalwood, frankincense, myrrh, or rose. Looking for more oil suggestions for this base? Grab an Essential Oils Desk Reference or Pocket Reference for more ideas than you can shake a stick at!